One of the simplest joys in life is taking my first sip of coffee in the morning. Since I can remember, I have been drinking this beloved beverage of mine without fail. My dedication to this drink is only rivaled by my love for its maker: The Keurig. Like finding a partner in life, finding the perfect coffee maker is essential because your sanity (I mean, happiness) depends on it. After many years of owning a variety of coffee brewing systems, I finally found my true love and partner in coffee brewing: The K55 Keurig system. Since I have invested in buying a Keurig, I haven’t looked back or regretted my decision. It was love at first use, and all my years of using other coffee makers faded away. It’s like when you meet your partner, you soon forget about those that preceded them because nothing else fared in comparison. 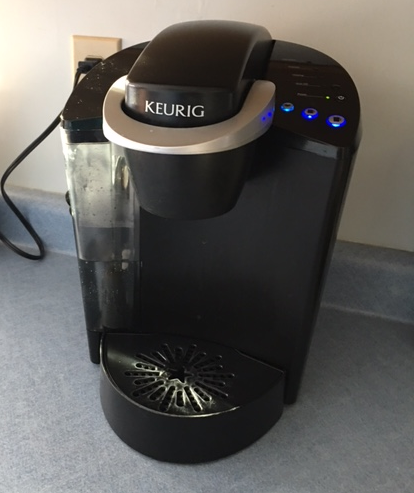 I currently have (two) K55 Keurigs: one at home and one for my office (yes, I am bit obsessed). The Keurig is the youngest of the coffee makers, as it wasn’t until the early 2000’s that they made their debut. 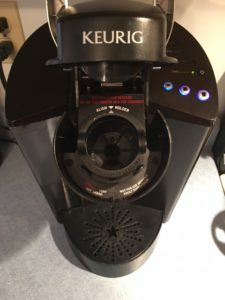 A Keurig is great for sole coffee drinkers in a household, or for those of us who have to run out the door in the morning and can only have one cup. Unlike its coffee maker predecessors, the Keurig doesn’t rely on a heating system to keep the coffee warm after its brewed. It simply heats the water that will be used to brew the one K-cup. Once the coffee is finished brewing, the Keurig cools off until it needs to be used again. 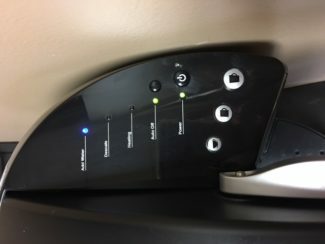 The design of these machines consists of a water reservoir on the side, a placeholder to put your k-cup, and three buttons on the top which give you a choice of the desired coffee cup size that you wish to make. There are not a lot of color options for the K55 Keurig. Your choices in color are a bright maroon or black. Typically, black can go with most kitchens, but the maroon can add some flair should you want to spice up your kitchen space. The wonderful thing about the Keurig is the fact it mixes the perfect balance of water to the grounds of coffee within a K-cup. You no longer have to worry about making too weak or too strong coffee (unless you buy the K-cups that way). The Keurig fits the Millennial in me: fast, good and instant gratification with the end result. The K55 Keurig is also pretty easy to figure out and use for any kind of coffee drinker. You don’t have to be a professional barista to make your favorite caffeinated beverage. Just put in your k-cup of choice, push the button on your desired coffee size and let the Keurig work for you. Once it’s finished brewing you have a delectable cup of heaven that’s fresh and wonderfully brewed. One of the negatives to a Keurig is the cost of the K-cups themselves. However, there online shopping outlets that offer discounts on bulk orders. I even found a local store that has deals on my favorite kind (Van Houtte French Vanilla). If you do some shopping around, you can definitely find a decent price on your preferred choice of k-cups. The K55 isn’t good if you plan on having a big gathering or party with fellow coffee drinkers around. The Keurig K55 is a better fit for sole coffee drinkers or for a smaller gathering. 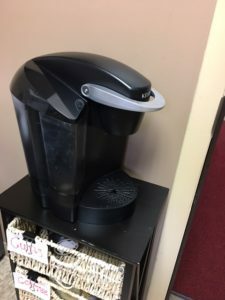 I have also found that many long time users of percolators or automatic drip systems don’t like the stronger taste of the brewed k-cups with brands like Folgers and Maxwell House. You are better off to brew a larger pot of coffee to satisfy a group of coffee lovers than trying to use your own stash of k-cups and overworking your Keurig. Read our Hamilton Beach Coffee Maker Reviews if you want to know more about Hamilton Beach coffee machines. One of the most unique aspects of this brewing device is the cleaning of the K55 Keurig. The water reservoir is not meant to be place in a dishwasher, but to be rinsed with white vinegar or Keurig descaling solution. Over time calcium deposits build up inside the Keurig, hampering the overall performance and longevity of the machine. If you choose to use white vinegar to rinse out the Keurig, diluting it with cold water helps get the vinegar smell and lingering residue out quicker. You will have to do a few rinses and run a couple cups of water through the Keurig before trying out an actual k-cup. If you can still taste the vinegar, just keep on running water through the device. Your Keurig will eventually be rid of the smell and your coffee will be back to tasting heavenly once again. For those coffee lovers who want to use a product that is specifically meant for cleaning, there is a Keurig descaling solution. This product is odorless and functions the same way as vinegar does in cleaning out the calcium that accumulates over time throughout the Keurig. This solution can be found online or at local mainstream retailers. The Keurig K55 ranges in prices from $79 to $120. Extra Keurig accessories can be included in the higher priced K55 devices. Some retailers may include different brands of k-cups, cleaning solution or a k-cup stand as part of the packaged deal. When looking for a Keurig, be sure to buy from a trusted retailer or seller before you find a sale that’s too good to be true. Their ease of use and brewing style make Keurigs more expensive for a reason. Just don’t let a good deal deter you on finding the right (working) machine for you.